Red pandas weigh between 6 and 13 pounds, have a head and body length of 22 to 24 inches and a bushy tail measuring 14 to 18 inches. The body is covered with long reddish-brown fur on the upper parts and blackish fur on the lower parts. They have a light face with dark tear markings, and a light-ringed tail. The roundish head has medium-sized upright white tipped ears, a black nose, and very dark eyes. The legs are short, and the soles of the feet are covered with dense hair and have curved semi-retractable claws. The front paws are equipped with a 'false thumb,' that is really an extension of the wrist bone to assist in holding bamboo and climbing trees like the Giant Panda. The eastern species may be somewhat larger and darker in color than those found in the western area. Red Pandas live in temperate forests of the Himalayas and high mountains of northern Burma. The habitat of the Red Panda is between 2,200 and 4,800 meters in temperate forests with bamboo understories. Gestation is about 134 days. Red pandas are excellent tree climbers; most active at dawn, dusk and at night foraging for food. Most of the day is spent resting in trees conserving energy, as their bamboo diet has a low energy content. Adults are normally solitary outside of the breeding season. At the onset of mating season a male and a female rest, move and eat in close proximity, as scent-marking the territory increases. A litter of usually 2 cubs is born in a nest in a hollow tree or rock crevice, and the young stay with their mother for about a year. Red pandas' vocal repertoire is small but varied (squeal, snort, grunt, etc.). They have a maximum lifespan of approximately 14 years. After gestation of about 134 days, litters of 1-4 young are born in nests made of twigs and grass. 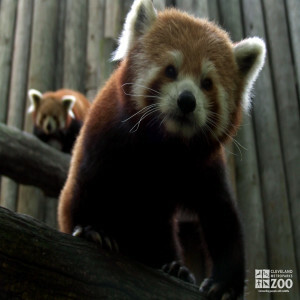 Red Panda young are nest bound for approximately 90 days. At birth their eyes and ears are closed, their bodies are covered with thick gray-buff fur, and they weigh between 110-130 g. Eyes and ears open by day 18, adult color and coat pattern appear about day 50, and by day 60 they engage in play. The young attain adult size by about 12 months and sexual maturity by about 18 months. Cubs stay with their mother until the next breeding season starts.